AutoSuccess addresses the specific needs of new car and light truck dealerships by providing ideas, tips and solutions on topics impacting those in the automotive sales marketplace. We are dedicated to helping automotive professionals improve their team’s effectiveness and their dealership’s profitability in both the short and long term. For nearly two decades, AutoSuccess has never lost focus on this core concept, and has evolved to encompass new technology and the evolving needs of sales professionals as they strive to meet the evolving needs of their customers. 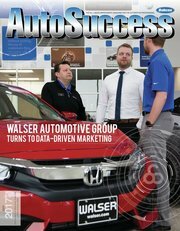 The AutoSuccess target audience is made up of automotive professionals in leadership roles — primarily dealers, general managers and department managers — who are capable of making final decisions about their areas of influence. AutoSuccess is delivered to more than 22,500 new car and light truck dealerships in the United States and Canada each month. The publication reaches far more professionals than that, however, thanks to pass-along readership and its availability on mobile and Web platforms. AutoSuccess also connects with its audience through Webinars, podcasts, newsletters and more, all designed to support and enhance the magazine’s core mission. Do you wish to receive AutoSuccess FREE?